Yes, yes, it'll have a good camera - but what else, Nokia? The Nokia Lumia 928 simply cannot wait for its own official announcement, with the handset showing up in a double page ad in Vanity Fair. It's not even the first time the Lumia 928 cat has exited the Nokia bag - a billboard was already spotted over the weekend promising "the best low-light smartphone camera". 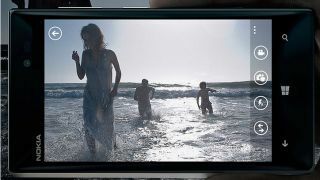 So it's no huge surprise that the Vanity Fair ad also pushes the handset's PureView camera, promising a Carl Zeiss lens on board. Given the Verizon logos splashed around both ads, we've deduced that the 928 will launch in the US on Verizon, although there's no clue as to what networks the rest of the world are looking at. Nokia's premature ad also includes a URL which takes you to a Verizon-free version of the ad on its US website; not much more to glean at this point other than that the design looks perhaps a tiny bit boxier than we're used to. Don't expect the Lumia 928 to break any world's slimmest records though - it looks like a fairly sizeable waistline is on the cards. So when will Nokia actually admit that this thing exists? We're expecting the Nokia Lumia 928 to be unveiled at the company's event in London on May 14.